More than a century ago, the Lumiere brothers’ black-and-white documentary film “Workers Leaving the Lumiere Factory in Lyon” showed workers hurriedly exiting their workplace. The film survives as one of the most important records in the history of motion pictures. 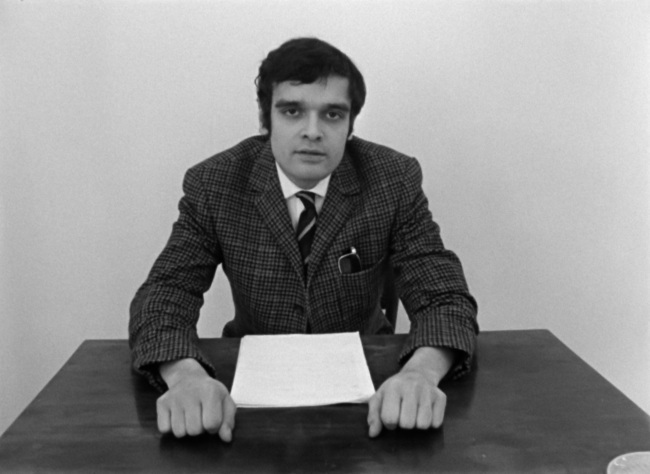 A century later, the late German artist and filmmaker Harun Farocki summoned the groundbreaking footage to yet another level of discourse. Farocki’s video installation titled “Workers Leaving the Factory in Eleven Decades” starts with the Lumiere brothers’ footage and proceeds in chronological order with footage of people leaving workplaces all over the world. The result is a historical investigation of workers, revealing the differences and similarities in working conditions in different times and spaces. The National Museum of Modern and Contemporary Art’s latest exhibition “What Ought to Be Done? Work and Life” is a solo exhibition featuring nine works by Farocki, who investigated the notion of labor, war and technology. Another set of videos, titled “Workers Leaving Their Workplaces,” depicts how people in 17 contemporary cities leave the collective workspaces, dispersing as individuals. “Labour in a Single Shot” is a set of video installations that show one- to two-minute uncut shots of different scenes of labor. The videos feature physical movements of workers performing different tasks, as well as working conditions that surround them. There is no narrative, but there is an abundance of details. The videos reveal primitive yet sacred aspects of manual labor, suggesting that there is something unique about the physicality of labor. Farocki and Antje Ehmann started the “Labour in a Single Shot” project in 2011, but the project came to an abrupt halt when Farocki died in 2014. Ehmann later picked up the project, continuing to add shots. The exhibition shows all 15 shots taken by Farocki as well as the most recent one taken by Ehmann in 2017. Meanwhile, the exhibition draws attention to how Farocki manipulates an exhibition space to display his images. 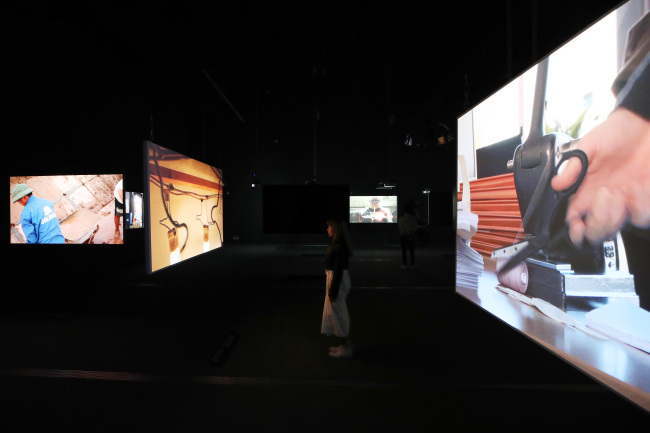 “Farocki was keenly aware of the difference between the gallery space and the dark theater,” said Ehmann during a press conference held at MMCA Seoul on Thursday. 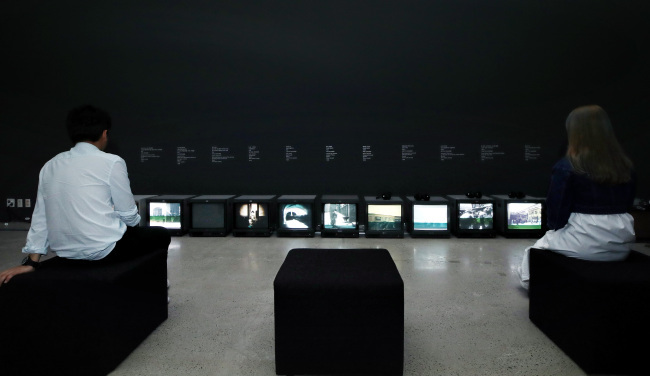 According to Ehmann, Farocki differentiated works that were to be displayed in museums and in black boxes. Farocki’s works on show at the MMCA are closer to works of fine art than narrative-centered films. The lack of narratives may stand in the way of the viewers completely immersing themselves in the works. Rather, the works invite the viewers to look at the documentary aspect of the videos, to think about reality and eschew their own reality in the manner of Bertolt Brecht and the Frankfurt School. Farocki’s 1995 work “Interface,” influenced by French filmmaker Jean-Luc Godard’s 1975 work “Numero Deux,” is illustrative of the artist’s early interest in experimenting with images and techniques. Forty-eight films by Farocki will be screened at the museum starting Nov. 14. Curator Kim Eun-hee noted that “What Ought to Be Done? Work and Life” overlaps with the museum’s past exhibitions, such as the Philippe Garrel retrospective “A Dazzling Despair” and Jonas Mekas’ retrospective “Again, Again It All Comes Back to Me in Brief Glimpses.” Screenings of the two artists’ major film works accompanied those exhibitions as well. The exhibition “What Ought to Be Done? Work and Life” runs through April. 7.